Housing and Urban Development Secretary Ben Carson defended his agency's delay in instituting regulations to protect transgender individuals in homeless shelters because "there are some women who said they were not comfortable with being in a shelter" with "somebody who had a very different anatomy." "Remember it is complex," Carson said. "We obviously believe in equal rights for everybody, including the LGBT community. But we also believe in equal rights for the women in the shelters, and shelters where there are men, and their equal rights. So, we want to look at things that really provide for everybody and doesn't impede the rights of one for the sake of the other." 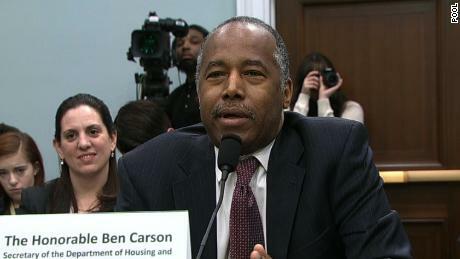 Pressed by Quigley as to how protecting transgender individuals would infringe on the rights of others, Carson said, "There are some women who said they were not comfortable with the idea of being in a shelter, being in a shower, and somebody who had a very different anatomy."